Right, so, first review of the new year. Hopefully I should be more prolific this year, but considering how long I took with this one, that could be high hopes. Anyway, Ringworld was practically forced on me by my fiance, who is very much a fan of the world-building style of science-fiction novels. Me, not so much, but I agreed to read it because I do find them as a whole interesting, if not wholly satisfying. So how did this measure up? 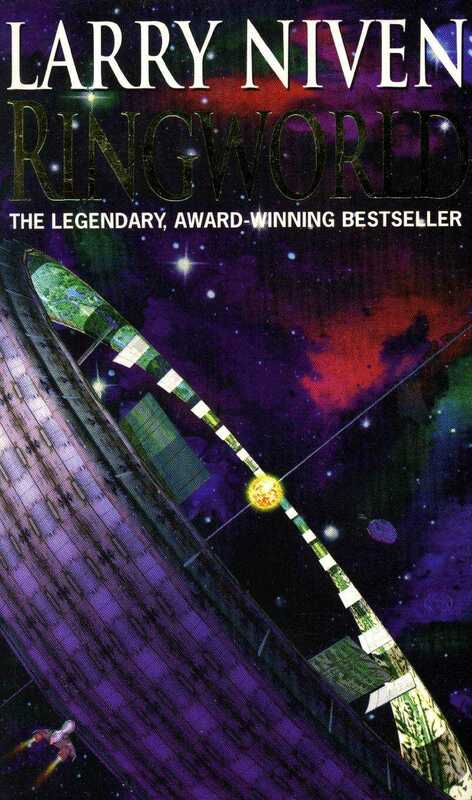 Ringworld for the most part follows Louis Wu, a human who is contacted by a Puppeteer, a creature long absent from all of known space, who needs him for an intriguing mission. His experience of exploration will be combined with the resources provided by the Puppeteer, named Nessus, as well as the combat skills of the tiger-like Kzin known as Speaker to Animals, and the supposed luck of a human named Teela Brown; with these qualities, they intend to examine and potentially explore a strange structure dubbed the Ringworld. As you can probably tell from the cover there, the Ringworld is an artificial structure built within the Goldilocks zone of a yellow star, creating a living space that is just about incomprehensible to the human mind. Their plans are quickly thwarted by a strange set of circumstances and they must deal with each other's secret agendas and the unknown surface of the Ringworld. From the synopsis, this all sounds too good to be true. It kind of is. I'll talk about the good stuff first. For one thing, it is a very thought-provoking book, with concepts of future technology and the process of moving out into unmapped territory all very well fleshed out. The group dynamic between the war-like Speaker and the cowardly Nessus, and the humans who try and balance them out, is engaging and progresses in an understandable and logical way. And the overall plot is generally easy to follow, despite the occasional bit of technobabble that can seem a bit overwhelming at times. So there's a lot to like and recommend this for. That is, before I get to the negative aspects, which may well be a game breaker for some readers. Firstly, although I praised the group dynamic, I can't really deny that the group's consistency and logical development largely hinges on the characters not really being much more than a 2D concept. For example, if somoene had told me that Speaker was meant to be a Klingon, or any of the other alien races that have been created as war-like but honourable, then I would believe them pretty damn quickly. Nessus is a perfect example of a cowardly race most concerned with safety, despite being touted as one of the "insane" ones. Teela, the supposedly lucky one, is characterised by her near horrifying lack of knowledge about pain and sadness. Louis, despite being the point-of-view character, felt kind of like a void of personality, doing things simply because it was the mid-point between the beliefs of Speaker and Nessus. Each gets some development, but never enough to make them feel fully fleshed-out or believable. It's like putting paper cutouts on an immaculate oil landscape and expecting the audience to buy that the two things were given the same amount of effort and time. As a result of this, I kind of felt that some of the moments in the book that should have been really important and awe-inspiring just fell flat, simply because the characters didn't have enough character to impart the impressive nature of what they were witnessing. Secondly, while most of the concepts introduced were things that I could accept within suspension of disbelief, there was one thing that seemed strikingly out of place. The flying motorcycles that could dispense food and water? I could buy that. An artificial day/night cycle created by metal plates between the Ringworld and the sun? Sure, that makes sense. The evolutionary path of the Puppeteers? No, now that's just silly. For those of you interested, take a look at what they're supposed to look like. So, the Puppeteers. A three-legged, herbivorous race with two heads that act as eyestalks/hands and a large hump on their backs concealing their brain. I cannot, for the life of me, conceive of an environment that would allow for such creatures to evolve in the first place, let alone become the dominant species of their planet and achieve space travel. I'm all for aliens that don't just look like humans with face-paint (see the Turians from Mass Effect, my favourite alien species, as an example), but there is a point where you have to stop and ask "No, really, how is this a thing that people take seriously?"